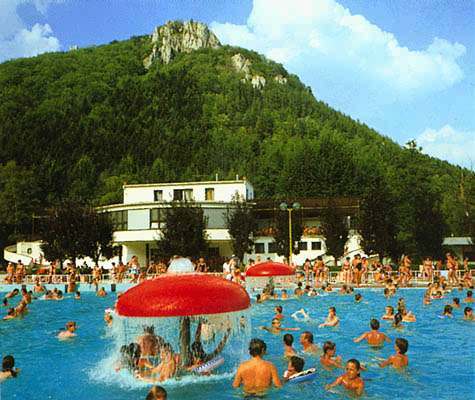 Spa city Rajecké Teplice is situated in picturesqe and with civilization infirmities less hit part of Slovakia on the walley of the river Rajčianka.The Mountains of small Fatra and Stražovské hills are connected here and they create wings of very different shades of green colour. The first reliable testimony about the existence of the settlement Villa Tapolcha and spa sources comes from th document of king Ladislav Veľký from the year 1376. The earth – alcalic sources are known for a long time before this year. They spring from deprh of 1500 m in 5 sources. Thir temperature is aproximately 38°C. Doctors and scientists were interested in healing power of these sources already in Middla Ages and their news spread fame and acqaintance of spa all over Hungary. 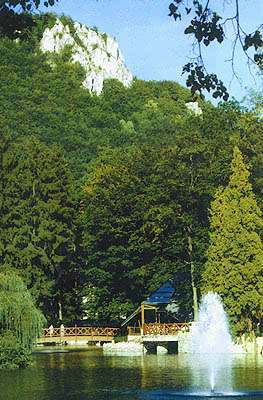 Growth of th village and spa was evident specially after the year 1899 when the railway betwen Žilina and Rajec was finished. New century brought big changes. Eletricity and water main were introduced, spa was built and reconstructed. Today deseases of mobile organism and nervous system are cured here. Rajecké Teplice became an independent comunity in the year 1920. Many fights took place in these places during the World War II. After the war there was built a thermal swimming pool , lake was arranged for recreation aims and surrounding woody grounds were opened to the public. The biggest enticement for meny visitors is wonderful nature with towered rocky formations, caves and cracks from limestones and dolomits. We can find here a large variety of Carpathian flora , we can see badger, fox, marten, owl or eagle in the woods. Surrounding grounds give to visitors experiences from winter or summer sports, rocky formations are great as a drill – ground for mountain climbers, cave man and rogalists. There are marked 100 km of roads for cycling in the area. The city provides you by cultural experiences trough summer cultural and fest celebrations.